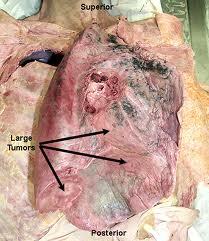 Most asbestos lung cancer starts in the lining of the bronchi, the tubes into which the trachea or windpipe divides. However, asbestos lung cancer can also begin in other areas such as the trachea, bronchioles (small branches of the bronchi), or alveoli (lung air sacs). Although asbestos lung cancer usually develops slowly, once it occurs, cancer cells can break away and spread to other parts of the body. The two most common types of asbestos lung cancer are small cell lung cancer (SCLC), in which the cancer cells are small and round, and non–small cell lung cancer (NSCLC), in which the cancer cells are larger. Sometimes a cancer has features of both types, and is called mixed small cell/large cell cancer. Non–small cell lung cancer accounts for almost 80% of lung cancers. Small cell asbestos lung cancer accounts for about 20% of all lung cancers (American Cancer Society, Lung Cancer). Although the cancer cells are small, they can multiply quickly and form large tumors. The tumors can spread to the lymph nodes and to other organs. Early–stage asbestos lung cancer may be asymptomatic (without symptoms). The methods used to diagnose asbestos lung cancer include imaging tests, biopsies, and taking phlegm (spit) samples.